I imagined, Gentle Readers, that compiling this year's retrospective of opera-going would present fairly few challenges. Folly! Reviewing this year's performances (an admittedly indulgent practice) has shaken my confident creation of hierarchies and left stray runners-up begging for attention. So here, a little more disorderly than usual, are my lists for the year. Emilie: I usually resist to the utmost of my power the declaration of Absolute Favorites, but for this year, this opera by Kaija Saariaho might be it. A tautly constructed opera, creatively orchestrated, with a great libretto, centered on the accomplishments and inner life of an eighteenth-century noblewoman-philosopher... what's not to love? Le Roi Malgré Lui: Frothy French operetta in a sly 1930s-Hollywood production? Yes, please. The zany screwball antics of Thaddeus Strassberger's production were smart enough to keep me intrigued as well as entertained, and the fearless and talented cast won my heart. Perhaps most importantly, Emmanuel Chabrier's score is in on the jokes of frothy French operetta. Un Ballo in Maschera: If using the tropes of films of the '30s and '40s is a directorial trend, I applaud it. Not only do I think it has great potential as a vehicle for playing around with the treatment of gender that bedevils much of the nineteenth-century rep, and the shades-of-grey politics ditto, it also has great potential for gratifying my taste for Art Deco, Ingrid Bergman hats, and three-piece suits. David Alden's production was not without weaknesses, but its melodramatic moodiness suited the work well, and the singing was very fine. Standouts in a strong cast were Sondra Radvanovsky and Dmitri Hvorostovsky as Amelia and Renato, both tortured by divided affections. La Clemenza di Tito: This was an unexpected late highlight of the Met's fall season. Jean-Pierre Ponnelle's production has stood the test of time, the orchestra was on fine form under Harry Bicket, and the vocal and dramatic performances were all strong. The performance combined sensuality, political tension, even an element of humor thanks to Barbara Frittoli's excellent Vitellia, and I fell in love with Mozart all over again. Götterdämmerung: This managed to be a really searing, satisfying performance despite Robert Lepage's production. Having lavished adjectives of scorn and disillusionment on it, I'd like to now give it the cold shoulder. Waltraud Meier's Waltraute might be enough to convey epic grandeur to just about anything; the performances of the Gibichungs were vocally strong and dramatically nuanced; and Deborah Voigt and Jay Hunter Morris were an intensely moving Brunnhilde and Siegfried. The title of Michael Spyres' first recital album, A Fool for Love, demonstrates a pleasing degree of self-awareness about the fate and faiblesse of many (most?) romantic tenors in the operatic canon. Another album of tenor arias, you ask, Gentle Readers? Well, yes! This one offers an original narrative as its organizing principle, but what really sets it apart is the varied selection of arias and Spyres' thoughtful execution of them. If you want a track by track summary of the story as imagined, Gentle Readers, it's there, but you may enjoy the music as well without it. Spyres does a very fine job of inhabiting each character; in the end, I think, this works against following the journey of one, though the arc of the tracks still works well. I love Virgil's Aeneid. Even moderate attention will reveal its rich imagery, and the exciting rhythms of its language. Closer attention reveals the brilliant balance between control and destructive passion, the unexpected twists that are exactly right, the detail which can seem almost onerously dense, until suddenly the moment comes that reveals its overwhelming collective power. Not otherwise, Berlioz's Troyens, also a work of vast proportions and great beauty, manages to weave together episodes of widely differing orchestral and dramatic textures into a whole packed with dense detail and unexpected musical twists, a whole that feels inevitable as perhaps only an epic can. Monday's performance at the Met, though, seemed an imperfect translation of this grandeur, too often halting, too infrequently reckless. Many of its elements were very good indeed, but the driving force to turn these into a satisfyingly overwhelming whole was lacking. Francesca Zambello's production, while often visually striking, had a tendency to heavy-handed symbolism. Some of her choreographic choices, notably in the presence of other couples on stage during the Nuit d'ivresse, suggested the possibility of an anti-imperialist reading that would also address the gendering of conquest and the conquered... but I didn't find these developed strongly (to my disappointment.) That Carthage should look so like the feminized Oriental Other and then fail to get postcolonial reflections from the production surprised me. The successes--Hector's bloody spirit, the relationship between x and his young wife--were of lesser overall significance. Fabio Luisi's conducting caressed many of the beauties of Berlioz' score, and the woodwinds played with special sensitivity. I felt, however, that a sense of irresistible impulsion, even of impulsiveness, would have made the orchestral contribution much stronger as a whole. It wasn't as bad as translations that turn breathtaking enjambments into end-stopped lines, but it left a similar impression of opportunities lost. Still, there were moments when it kindled into brilliance. 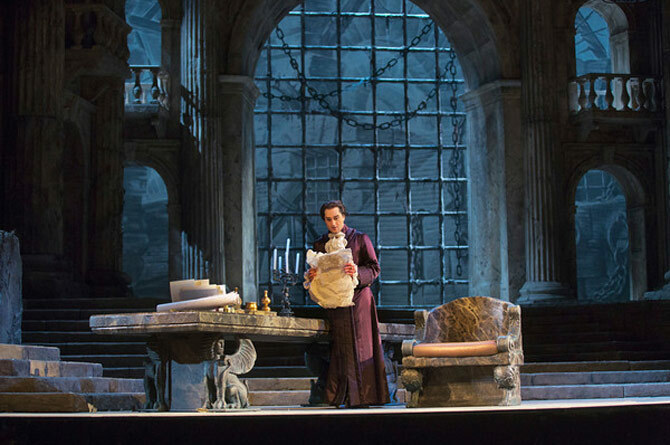 The vox populi is correct: the Met's revival of Clemenza di Tito is not only musically polished, but emotionally compelling, and stylish throughout. Jean-Pierre Ponnelle;s production employs elegant aesthetic hybridity, combining allusions to eighteenth-century Europe and ancient Rome in both the architecture and the costumes. The sets are characterized by symmetry and proportion, those shibboleths of the Augustan age, and the Personenregie is formal but not lacking in emotional intimacy. Some of the gestural conventions might have seemed stale, had they not been so convincingly employed by the singers, but as it was, I found myself moved by Ponnelle's tableaux. I especially appreciated the early distinction made between Tito's public and private personae, the staging of the emperor's Act II deliberations in an eighteenth-century gentleman's study, and the dramatic lighting for Vitellia's journey towards self-knowledge in "Non più di fiori." More frivolously, I liked the opening which sets up Vitellia's political persuasion of Sesto as pillow talk. The performance--including the late substitution of Geraldine Chauvet for the indisposed Elina Garanca in the role of Sesto--made a great case for the intellectual, emotional, and musical refinements of Mozart's work. 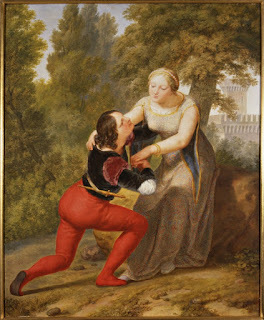 At Beatrice di Tenda's Venetian premiere in 1833, the audience was vociferous in expressing their resentment of what they perceived as a derivative piece, not worth their long wait for a new work by Bellini. Giuditta Pasta, the diva for whom--and at whose instigation--it was written, resorted to dramatically declaiming to the unruly carnival-goers the line intended for the tyrannical baritone: "If you cannot love me, respect me!" The audience was quieted, and the opera survived, although in relative obscurity. At Wednesday's Carnegie Hall performance, by the joint forces of the Collegiate Chorale and the American Symphony Orchestra, the audience was docile, and gave the diva of the evening, Angela Meade, the acclaim she richly deserved. I found it impossible, however, to accord the work itself more than a somewhat reserved respect. Bellini's gift for melody is on fine display, and there are some impressive musical moments, but the parts of the opera, at least on this showing, failed to cohere into a gripping whole, despite the contributions of an accomplished cast. On Saturday evening I had the opportunity to go to the National Opera Center for the first time (it's lovely!) to hear an evening of staged opera scenes. The concept behind Replenished Repertoire, brainchild of soprano Allegra Durante, is a simple one, but challenging in execution: to use a small number of singers in staging a wide variety of scenes from across the operatic repertoire. The singers get experience and a chance to show off their versatility, the audience gets a smorgasbord, some unfamiliar pieces get an airing; everybody wins.